Anyone that has been through Air Force Basic Training will no doubt remember the distinctive sound of the Military Training Instructor's taps. The sound of metal striking the ground in a determined rhythmic cadence is enough to send shivers of horror and dread through the body of any trainee. Although some may believe that the taps were worn for intimidating trainees, that is simply not so. Also known as cleats and plates, taps have a long military history that dates from the 1800s. The purpose then, as it is now, is to extend the ware of the heels and soles. The 93rd Sutherland Highland Regiment of Foot was raised in 1799 from the lands in northern-most Scotland. In 1805 they served in the recapture of the Cape of Good Hope and remained in garrison there until 1814 when they were sent to America for the New Orleans campaign. At New Orleans the 93rd suffered the heaviest British casualties as they remained "firm & immovable as a Brick Wall" (no running through the brambles contrary to a popular song). The 93rd Sutherland Highland Regiment of Foot Dress Regulations Napoleonic era circa 1810-1815 included low quartered shoes, buckle style, with Iron heel plates and hobnails. 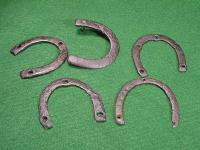 The leather heels of the Brogan shoe were protected by iron horseshoe heel plates to prevent wear and soldiers would sometimes have hobnails applied to the bottom of their soles to provide greater traction. The Olympics held in the year 1908 saw bitter insinuations exchanged between rival teams. There were accusations of cheating and unsporting behaviour. The team from the United States protested loudly against the type of footwear worn by the British team. The British team was made up entirely of police officers and they were wearing their usual heavy boots, which had steel heel plates. These plates sank deep into the ground giving them a sort of anchorage and thus strengthening their hold. With these advantages which were ruled as legal as they were part of the standard British Police uniforms, the British team walked away with the tug of war medals. It later turned out that they had had enough practice of the game too as tug of war had been the current favourite to fill in free time in the British Police force. Their supremacy did not last long. The Swedish team was able to lay its hands on the tug of war medal in the 1912 Olympics when the game was played on sand rather than on the usual grass. Here the natural advantage of the heavy boots was absent to aid the British team to pull in the medal. This is the first model of Pershing boot which arrived in France in the Winter of 1917 and would see widespread use through out the war. 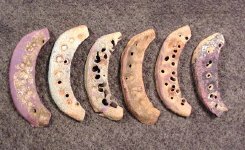 The boot was studded with rows of hobnails and iron heel plates covering both heels. Whether in Iceland or the jungles of Southeast Asia, the British soldier marched and fought in his hobnailed ammo'' or ankle boots. 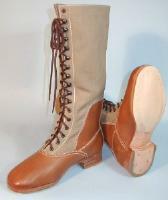 The boots were of ankle height and made with pebbled leather with a cap toe. 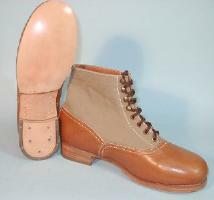 The bottom of the boots were made with a leather sole and heel cleats, toe plates and hob nails. All boots and shoes were laced, according to regulations, in the ladder lace method. 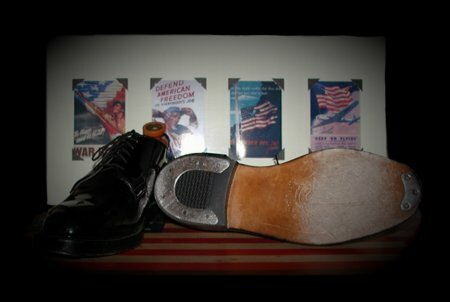 Special units such as the SAS, Commandos and other units on special assignment would wear similar boots as the 'ammo' boots but they had rubber cleated sole boots. 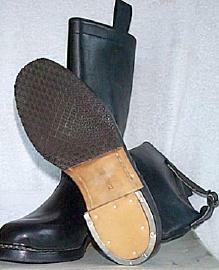 During World War II, the German military wore heel plates, toe plates, and hob nails on several different style boots. 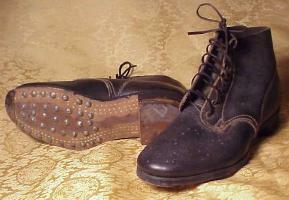 In the 50's, a fad was to have a shoemaker attach small crescent-shaped metal taps to one's street shoes. They were placed on the heel of each shoe where a person's walking pattern caused the most wear. 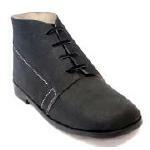 As in the past, the purpose was to extend the life of the heel. The 50s trend toward teenage rebellion took to the extreme when boys attached metal taps to the bottoms of their shoes. No longer the strong, silent rebel, the tap-shoed ruffian brashly advertised his tough image via taps that would scrape and clack against the road or sidewalk, and even in school halls. This noisy style drove parents and teachers crazy, and were soon outlawed in schools. 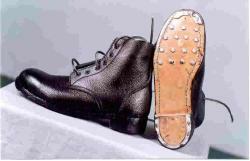 Boys started attaching metal taps from tap shoes onto their own oxfords, but as the trend grew, other things like bottle caps, pieces of metal, and even pony-size horseshoes were nailed onto the sole of the shoe to produce the clacking sound. The style was most likely borrowed from the young street performers who tap-danced on the sidewalks of urban cities like Harlem. As would happen so many times in the decades to come, teens took the style from the street corner and brought it to suburbia. Shoe repairmen had a booming business with rebel teens who had true metal taps riveted to their soles. A half-moon clip would be nailed to the front toe tip, and a heavy block to the back heel. Kids who couldn't afford the taps, or who were late to the trend and couldn't get taps from the shoe store, often made their own. The taps weren't just for sound; letting your metal taps drag along the asphalt while riding your bike produced a spark shower to rival New Year's Day at midnight.